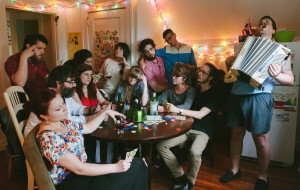 The Collection, a Greensboro N.C. folk group, released the first single “Capernaum” from their upcoming album Ars Moriendi. The group, headed by David Wimbish, is really more of a rotating door of various musicians ranging from 13-18 members who play a variety of instruments from guitar and drums to phin (apparently an ethnic Laotian lute) and didgerdoo. If you like “Capernaum,” Ars Moriendi is set for a July 15 release, and be sure to check the band’s site for upcoming tour dates in support of the new LP.